My son and I just did the northern section and took our time. We really enjoyed the trees and peeking at the creek every once in awhile. We climbed the waterfall at the end with all those huge boulders and saw the man made ravine. We climbed the wall to see that large reservoir before turning around and coming back. We didn't do the southern part but realized we were on it today when we did the Upper Bull Creek hike. We just did a small section of it but it was well maintained. I started out from Cedar Breaks and camped near Sawyer, then the next day finished the hike at Russell. The southern part of the trail is MUCH better. By that I mean it is more of a trail. Basically after mile 9 you are on caliche road the rest of the way. It would almost be better IMO to yoyo between cedar breaks to Tejas, although around Russell it is quite nice. After mile 9 I have no idea where the "real" trail was. It was pretty poorly marked and I no doubt missed a turn somewhere. Not a big deal because the roads and fences kind of tell you where to go. I have no idea where Marker 10 is and if you look at the map on this page closer you won''t see it there either ;) Mile marker 15 is almost as elusive and that little side loop from the road was very poorly marked. I really liked the southern portion. I gave the difficulty in the midrange just b/c of length. The terrain is real easy with only a few inclines. I had overcast both days, so the heat of summer would make the northern portion a bit more difficult (there isn''t much shade). The solitude is also midrange. There is plenty of time of being alone but if the lake is active, there is plenty of motor boats and seadoos cranking up the noise as well as the hootin and hollerin. Toward Tejas as the lake narrows to a stream, there are lots of fisherman. I only saw about 6 or 7 sets of hikers over two days and 1 set of cyclists. The northern part is open to bikes. All in all it is a nice hike so close to Austin for the length and the opportunity to backpack. I didn't really know about this trail system until finding it here. LCRA has done a wonderful jobe with setting this up. It looks like there is a lot of educational information in some of their REALLY nice buildings. I didn't get a chance to check them out but will on my next visit. This outing was a nice partly cloudy day in the mid 70s. I passed two horse riders and only two other sets of hikers for the entire hike. They were headed in the opposite direction. I went bobcat ridge to coyote road in a clockwise fashion. That section of the hike is a little less "intimate" b/c coyote "road" is just that. Riverside is nice and has a "boggy" section that was very interesting. I really like the next section along Cypress then Pine Ridge. They are hiking only (trailheads have a terrace blocking horseriders), so the trail is a small single track and winds closely around the landscape. Views of the colorado are refreshing and really entice you to jump in. The pine trees are great to walk among. Some that are in draws are of considerable size. Spring is upon us, os many of the trees were starting to bud and the smell of dogwoods every once in awhile was an added bonus. Pine ridge is the section where there is a bit of up and down terrain when you aren't on the ridge. There is a beautiful view of the valley below and colorado river as it head toward Bastrop. 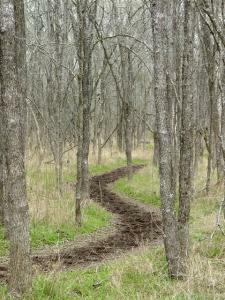 I will definitely be returning to for the northern trail and some of the intermediate trails. Going on this side is soooo much better. Right now the creek is full (really full) in this area of the greenbelt, so it is nice to take in the falls. Sure you can hear people on the other side, but most of the time they don't even know you are there. It was threatening rain so that thinned out the masses. However, it got to a nice 68F with only a few sprinkles. I highly recommend this side and area of the greenbelt for its solitude and lack of bike riders. You can't quite make it all the way to sculpture falls but close enough. BTW, north of Mopac is nice area to walk barefoot.